Ichiro drew all the cheers. Most everyone else on the Seattle Mariners did all the hitting. Batting ninth and knowing he'd get two plate appearances, Ichiro popped up and worked a walk. The 45-year-old star took his spot in right field to begin the bottom of the fourth inning, then was pulled to another huge ovation. He was met with hugs from the Mariners on the diamond. 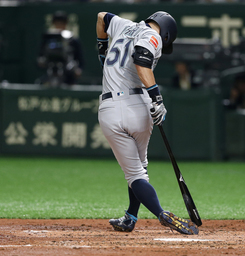 Mariners manager Scott Servais said Ichiro will play in Thursday's final game of the series, but there is no guarantee he'll start. This marked the earliest opening day ever - the summer sport actually started on the last day of winter. No doubt, most fans in North America were sound asleep when Oakland's Mike Fiers threw the first pitch at 5:36 a.m. EDT (6:36 p.m. local). A year after the Cubs' Ian Happ homered on the very pitch of the season, the ball again was flying. Tim Beckham also homered as several Seattle newcomers excelled. Khris Davis, who led the majors with 48 home runs last year, Stephen Piscotty and Matt Chapman connected for the A's. "It was great. It's a fun crowd to play in front of. Even the pregame stuff was exciting. I think everybody had a good time," Oakland manager Bob Melvin said. Ichiro became the second-oldest position player to start an opener, only a few months younger than Julio Franco was for Atlanta in 2004. Several of the players in this game weren't born when Ichiro began his pro career. Ichiro is getting very near the end of a sensational pro career that began in Japan in 1992 when he was at 18. He stopped playing last May to become a Mariners special assistant - after totaling 4,367 hits on both sides of the ocean - and struggled in spring training this year. Santana, one of many Mariners new to the lineup, had no trouble at the plate. His opposite-field grand slam capped a five-run burst in the third for a 5-2 lead and Beckham's drive in the fifth made it 9-4. Beckham got three hits and scored three times. Also making a nice debut for Seattle were Jay Bruce, who singled for MLB's first hit of the season, and Edwin Encarnacion, who scored twice. The Mariners won for the 12th time in 15 openers. They also beat the A's in 2012 when MLB last started in Japan. Athletics: RHP Marco Estrada makes his debut after signing with the A's. The 35-year-old was 7-14 with a career-worst 5.64 ERA last season for Toronto and was hampered by hip and back problems.